While 25 of America’s Presidents have been lawyers, China, for the very first time in its more than 60 years history, welcomes a former law student as one of the top national leaders. 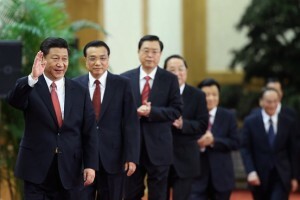 Li Keqiang, a Bachelor of Law degree holder from the Peking University, was nominated as Prime Minister in early March. Having been studying law both in China and America for four years, I could not be happier. It seems that the spring for lawyers has eventually come. In the larger picture, Chinese politics has ushered in a completely new era. Among 7 members of the new Politburo Standing Committee of the Communist Party of China, the de facto most powerful decision-making body in China, 6 have an academic background in humanities or social science, and only one is from engineering school. It is a highly intellectual group from a brand new background. The intellectual elites with social science or humanities background, such as economists and jurists, step onto the arena of history and start to play a predominant role in the largest ruling political party in the world. On the contrary, when Jiang Zemin was in power, all of the Politburo Standing Committee members were engineers or even senior engineers. It is a positive signal, that China finally says goodbye to Engineer-Presidents and will have more leaders with a social science or humanities background in the future. Throughout the history of the People’s Republic of China, the backgrounds of the top leaders have an outstanding generational characteristic. The first and second generations of top leaders, with Mao Zedong and Deng Xiaoping at the core respectively, were overwhelmingly revolutionists. They founded the socialist country in a hail of bullets and their main job was to consolidate the new regime against Western powers. The following two generations of top leaders, led by Jiang Zemin and Hu Jintao, were mostly technical experts in water conservation, geology, oil drilling and so forth. In the new era of Reform and Opening, everything took economic construction as the center. The engineers who were politically reliable and technologically talented easily stood out due to their exceptional contributions in infrastructure construction and machinery manufacturing. In the textbooks of political science, they are labeled as technocrats. I am not saying that they cannot lead the country well. Actually they are indeed competent to meet the demands of the times to rapidly develop the economy. But I fear that they are virtually unable to satisfy the public’s calls for democracy, economic equity and legal construction. As a law student myself, I know what it means to China. In the modern society, the increasingly diverse values and the growing complications created from social contradictions require leaders with humanist spirits and professionalism. The times have set the stage for more profound social changes launched by jurists and economists. If a person immerses himself or herself in the law classics such as On Liberty, The Second Treatise of Government, The Spirit of the Laws and so forth, they will spontaneously cultivate themselves a strong legal faith. It is a brief from the bottom of their hearts that perceives law as sovereign over any individuals or orders. With such sincere faith in mind, leaders are capable to cope with the issue more fundamentally and thoroughly, because it is achieved by means of law. Look at China’s neighbors. Most of Japanese politicians have a law or economics background. Ma Ying-jeou, the President of Republic of China (Taiwan), obtained LLM from NYU and SJD from Harvard Law School. In his term as the Minister of Justice during 1993 to 1996, he was famous for his stern attitude to fight against corruption among politicians and police, which even caused him to be fired. It is the basic virtue that every law student is taught to possess. He also set the best example for the leaders across the strait. Unfortunately, however, don’t get too excited about Chinese politics right now. When democracy can only be accomplished within the few top leaders in the Party, bureaucracy has more impacts on officials than education. Having experienced ups and downs in the official circles for more than 30 years, Chinese top leaders do not significantly differentiate with each other. Their degrees may range from law to history, but surely they are all extraordinary specialists in political trickery. In the current political ecology, it really does not matter whether you have a higher education degree. As long as you have power, nothing is impossible, not to mention a piece of diploma. Take new Chinese President Xi Jinping for example. From 1998 to 2002, he studied Marxist Theory and Ideological Education in an “on-the-job” post-graduate program at Tsinghua University, and obtained a Doctor of Laws degree. During those five years, he was the Secretary of Party Committee in Fujian Province, thousands of miles away from Tsinghua University. No matter how busy he was as the highest leader of a province, he could finish his doctorate degree at the best university in China as successfully as any other full-time Ph.D. students. How miraculous he was! Although the fact that the president has a law degree doesn’t necessarily mean that he would comply with the law all the while, at least there is such a word as “law” in his dictionary. As Chairman Mao once put, “The future is bright while the road is tortuous.” I don’t daydream the current social problems to be solved overnight. If the leaders show the will, the people will find the way. Jiaqi is currently a law student in the Rogers College of Law, University of Arizona. He studied law in Ocean University of China for three years. He cultivated great interests in Constitutional Law, International Human Rights Law and Immigration Law during these four year legal study. With a Nikon D7000 DSLR camera, he is keen on photography as well.